"When My Parents Split Up" is a HuffPost series that explores what it's like to have your parents divorce at all ages, from infancy to adulthood. Want to share your experience as a child of divorce? Email us at divorce@huffingtonpost.com. Tara Eisenhard's parents split up when she was 13. The pair handled the ensuing divorce so well, today their daughter considers herself a "divorce encouragist." "Their example taught me that difficult adjustments can bring about positive changes in an otherwise negative situation," said Eisenhard, a mediator and author of The D-Word: Divorce Through a Child’s Eyes. "Through the process, I also learned a lot about respectful communication and creative conflict resolution." Below, Eisenhard tells The Huffington Post more about her parents' divorce and adjusting to the family's new normal in her teen years. "I actually overheard them break the news to each other. They were arguing in another room when I heard my mom exclaim, 'Oh, get a lawyer! I can't talk to you anymore.' From there, they began asserting who should move out and when it would happen. Later that evening, my dad and I took a walk together and he confirmed a change was on the horizon. He didn't have any answers at the time but he said when they knew what was going to happen next, they'd tell me." "At first, I had a desperate need to know what was coming next but at the time there were no answers. As a result, I constructed my own idea of how things would go: I decided my dad and I would stay in the house where we lived and my mom and sister would rent a place within walking distance. That way, my family would be close enough so I could see both parents and my sister but my parents wouldn't be under the same roof to fight all the time. I thought it was a great plan, but unfortunately nobody consulted me about making appropriate arrangements. In reality, it was decided that my dad would move out and my sister and I would see him every other weekend. He relocated to the next town for a few months and then moved in with his girlfriend, who I barely knew, and her daughter, whom I'd never met. That was an uncomfortable transition and I tried to avoid visiting by spending as much time as possible with my friends. One good thing about going through the process as a teenager? I had the freedom to escape." "For the first several months, it all felt very strange. My reality didn’t feel real to me but eventually, we all settled into a new normal. I formed a close friendship with my dad's girlfriend's daughter­ -- so close, in fact, that she accompanied me on a vacation I took with my mom. My mom entered into a serious relationship with a man who helped out around our house and made us laugh. As a whole, I felt that my family grew and became happier. And the best part was when my parents became friends again. I have fond memories of the four of us and the dog happily chatting on the front porch before my sister and I were to leave for a weekend with my dad. As an adult, I’ve eaten Thanksgiving dinner with both parents at the same table." 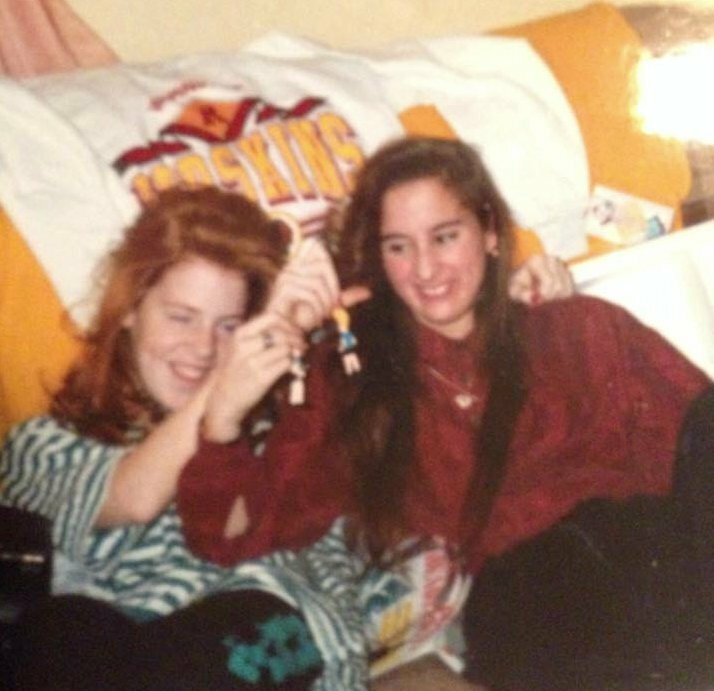 Tara, her dad's girlfriend's daughter and their prized Beavis and Butthead keychains. "At this point, I can say it was one of the most positive experiences of my life. Although they didn't always get along, my parents remained a team when it came to parenting. As a result of my personal experience, I reached adulthood believing divorce was a cooperative event and an overall good thing. It wasn't until I went through my own good divorce (and began receiving a lot of bad advice) that I noticed most families don't enjoy the same happy outcomes I did. The realization sparked my curiosity and prompted me to become a student of the process. I'm now an author, speaker, coach and mediator on a mission to improve the way our society approaches the process of family evolution." "Unique…Fluid... We've shifted away from the traditional parent/child paradigm. One of the gifts of divorce is that it strips away the strict labels and roles everyone played prior to the separation. It forces family members to confront their own humanity as well as each other's strengths and shortcomings. I've come to know my parents as individuals, and our present relationships reflect that." "If you're a teen whose parents are getting a divorce, my advice is to keep an open mind and roll with the changes. Divorce can be difficult, but it's also an opportunity to learn and grow stronger as a person. Reach out for help if you need it and trust that things have a way of working out even if they don't work out the way you'd once hoped."